One of the popular tourist destinations in Thailand is Krabi province. Most tourist will visit the famous Ko Phi Phi Islands, Ko Lanta Island, Ao Nang beach, Railey beach. They also dive at the Mu Ko Lanta National Park and the more sportive tourists will go rock climbing on the world famous limestone rocks in the Krabi province. Strange enough most tourists will only pass Krabi city on their way to a crowded developed beach road like Ao Nang or to the Ko Phi Phi Islands where you only bump into other tourists. Krabi city deserves your fair share of attention. This port city offers plenty off insight in Thai culture. In Krabi you can get good hotel deals, eat at fine restaurants or enjoy the very good food market at the harbor which is open every night. One underrated attraction surrounding Krabi are the large mangrove forests. 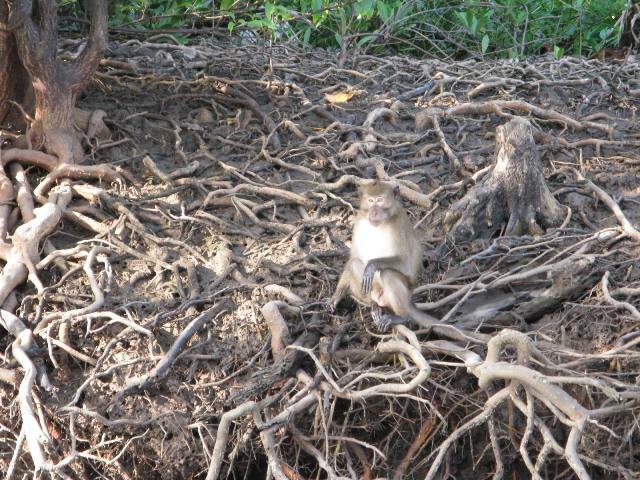 A maze of water ways through typical mangrove trees harboring untouched wildlife. Here you can see small monkeys searching for crab when the tide is low. Amazing tree roots during low tide, watch it closely to discover the monitor lizards hunting for prey. If you like birds you will be able to see kingfisher birds with their bright blue feathers. 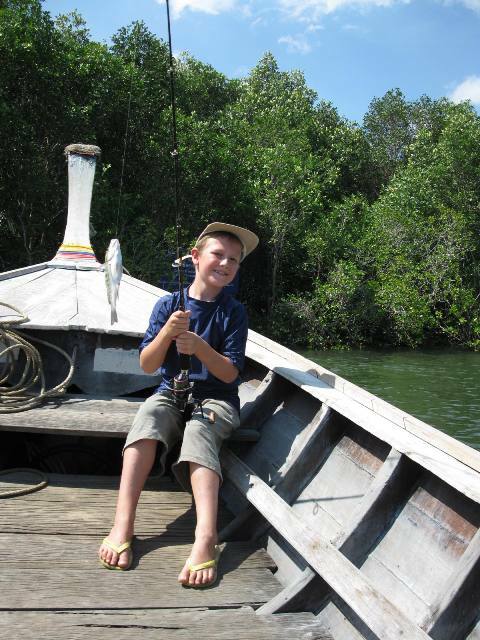 You can also ask your boatmen to arrange a fishing rod. Catch your own red or white snaper and ask any local restaurant to prepare it for you. That will cost you some 30 baht (75 eurocent) to enjoy eating your own catch. It's not that we don't recommend going to Ao Nang beach or the beautiful Islands in the Andaman sea. We just like Krabi because this city with her friendly people did not change much after our first visit more than 11 years ago. If you look at Ao Nang it changed, and not for the good. Everything is of course more commercial with that many tourist coming every year. It's more difficult to discover the true Thai hospitality at popular destinations. 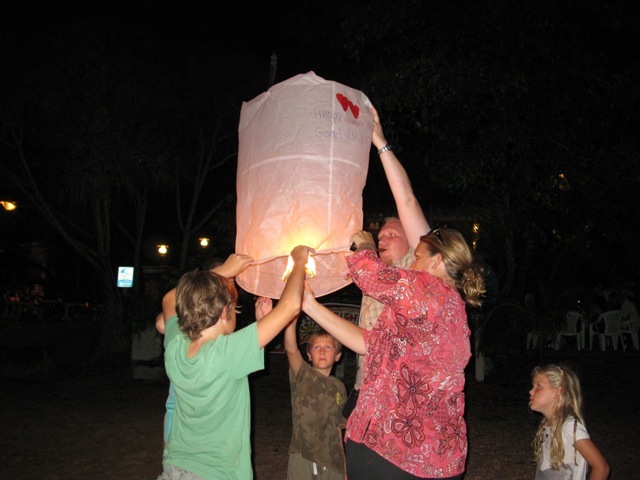 Krabi with an estimated 25.000 inhabitants is one of our 'must visit' cities. And people thought the same for ages, thousands of years and archaeological evidence indicates that Krabi was originally inhabited as early as 25.000 to 35.000 years ago. 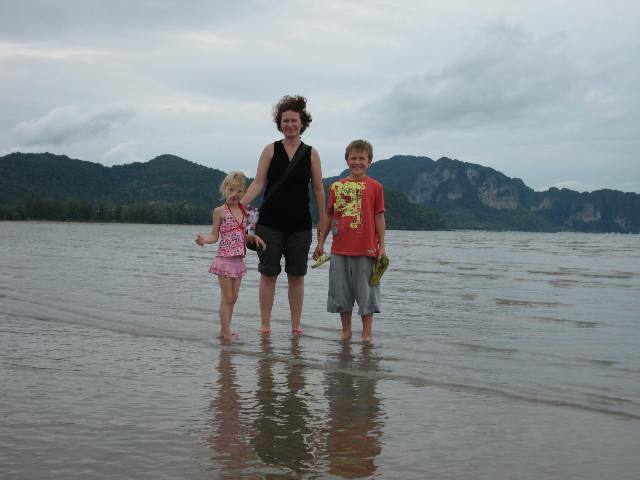 During our visit between 29 December 2010 and 8 January 2011 we rented a villa close to Ao Nang. 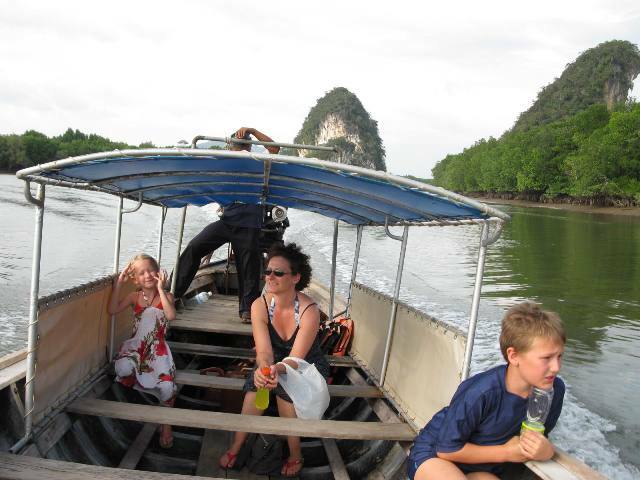 But we went to Krabi to hire our longtail boat to go to the Islands. It's more fun to chat little with the boatmen in Krabi than to hassle at Ao Nang. 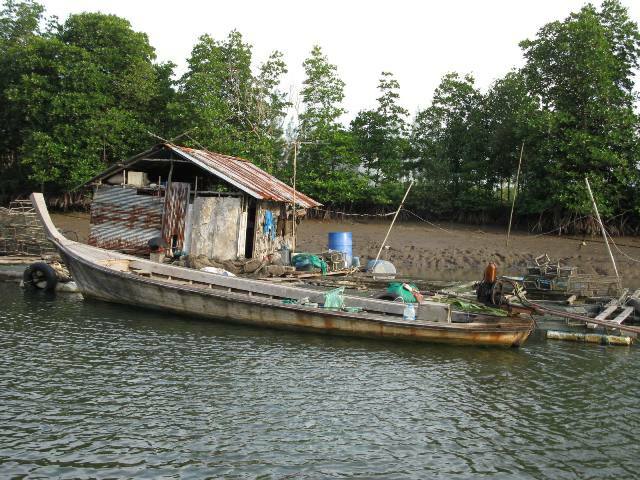 You can ask your boatmen to visit the floating fishponds. 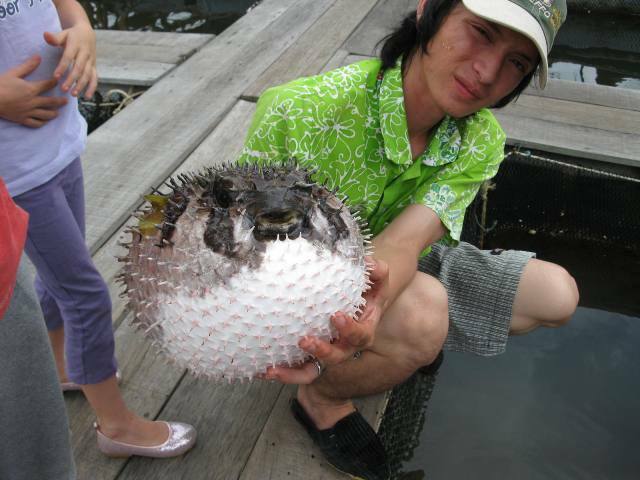 There you can eat fresh fish and the guys happily will show you a puffer fish. 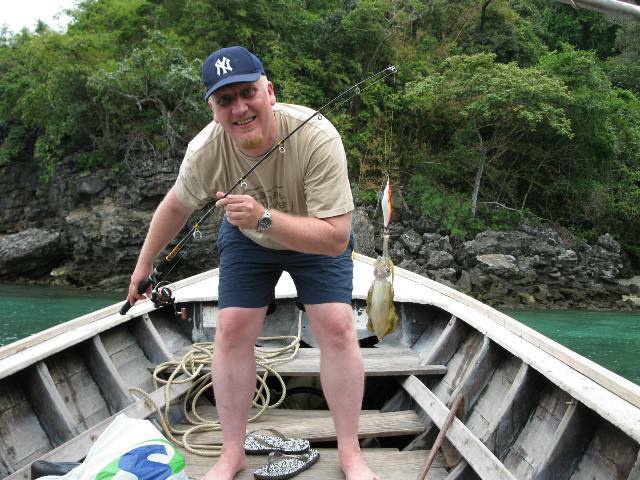 One day Yde and I went fishing in the mangrove forest. We also cought some small white snaper and the boatmen was lucky. He cought a full size red snaper, delicious fresh fish. This is why we like Krabi and Krabi province. Every day you can choose something completely different and it's all just beautiful. Snorkeling at the Islands, diving or fishing for squid at open sea. We did celebrate new year's eve at Ao Nang beach. And at that time it was also nice that many other tourist did the same. We celebrated the evening with a nice diner, nice cigars and together with one of my colleagues and his family. So what did those other tourist do to make that evening extra nice?. Many of them bought a hot air lampion for good luck or maybe just for fun. Anyhow it's an amazing sight to see hundreds of hot air lampions dancing in the air a couple of minutes before midnight. Watch the youtube movie for a short impression. I could not do anything about the lady Gaga music but you can't have it all. Feel free to send us more links.